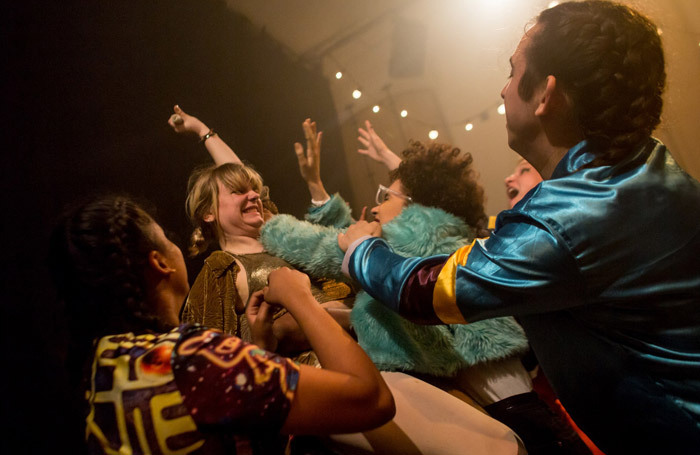 Part tacky talent show, part scornful send-up of contemporary culture, Fire in the Machine is a wildly energetic performance piece from youth theatre company Sounds Like Chaos. Devised for the Battersea Arts Centre’s Cash, Capitalism, and Corporations season, the show is a glittery collage of music, games, and daft vignettes exploring the nature of competition. Co-directors Gemma Rowan and Roisin Feeny give the chaos some structure, creating moments of stillness and surprising poignancy amidst a bewildering succession of skits. The large ensemble deliver these with a level of skill and commitment that often belies their youth, and with enough charisma to effortlessly win over their audience. Serving as MC, Bob Geyfer comments on the action from behind a keyboard, his voice manipulated through a synthesiser. Meanwhile, instantly likeable underdog Isabella Savin struggles to join in with the ever-changing routines, finally clambering into the audience to bask in our attention. Billie Hyde particularly shines, delivering an affecting speech about the fears and frustrations accompanying her looming adulthood. A brilliantly saccharine soundtrack from Keir Vine mashes together disco, hip hop, an á cappella Crazy in Love, and a cheery original song about petty cruelty. Kat Heath’s ambitious set resembles a garish gameshow stage, with performers entering through shimmering curtains in golden archways, flanked by flaring banks of multi-coloured light bulbs. The combined effect is gaudy and joyful, as thoroughly absorbing as it is downright bemusing. Though its style outweighs the substance, the show is nonetheless vital and vibrant.